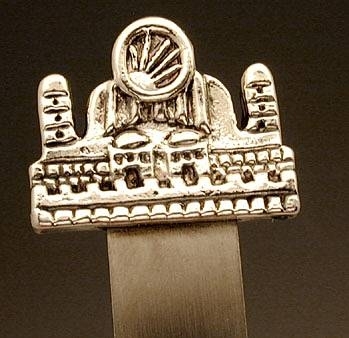 Jerusalem Bookmark Gorgeous artisan sterling silver (NOT silver plated) Jerusalem bookmark, Judaica. The top plaque is beautifully adorned with a superb depiction of the Holy city Jerusalem. This item was made in the electroforming method. A wonderful item bound to make an excellent gift to your book reading friends Measurements: Length: 14cm. / 5.512in. Weight: 14gr. / 0.45oz. Marks: 925 for sterling silver.